It was 35 years ago that Britain fought its “last traditional war”, travelling 8000 miles to reinforce their territory of the Falkland Islands. Beginning on April 2nd 1982 and culminating on June 14th of the same year, the Falklands Conflict resonated deeply with the British public, and is to this day felt very passionately about. With 255 British dead, and 777 non-fatal casualties, the 35th anniversary commemorations have a particular poignancy. 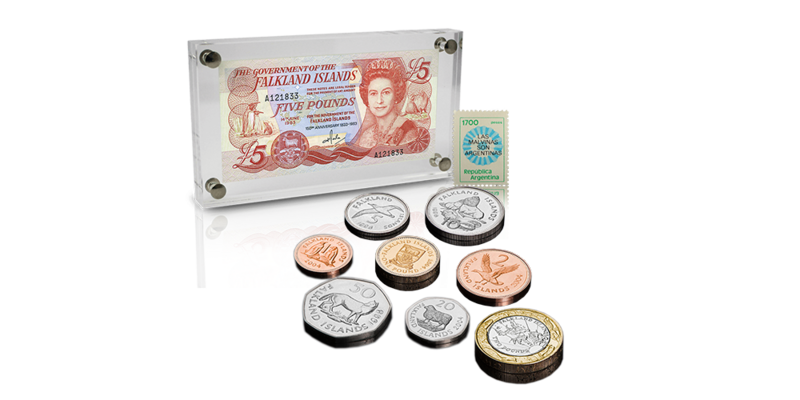 To commemorate the anniversary The London Mint Office are offering an exclusive set of circulating coins from the Falklands and an official banknote printed in the year following the conflict. The uncirculated set of coins, issued between 1998 and 2004, features denominations from 1 penny up to the two pound coin. The obverse depicts a variety of the Queen’s official portraits, while the reverse features the famous animals of the Falkland Islands. The Falkland Islands banknote is beautifully preserved and exclusively displayed in a presentation mount and depicting the animals synonymous with the Falkland Islands. This set of uncirculated coins and banknote makes a powerful statement in reflection of the conflict in the year following – how differently the currency could have looked had the islands been occupied by the Argentines at the conclusion of hostilities.